The classical values of outsourcing are stronger than ever: cost, standardization and global delivery, according to “2013 State of outsourcing” Study, conducted by KPMG. 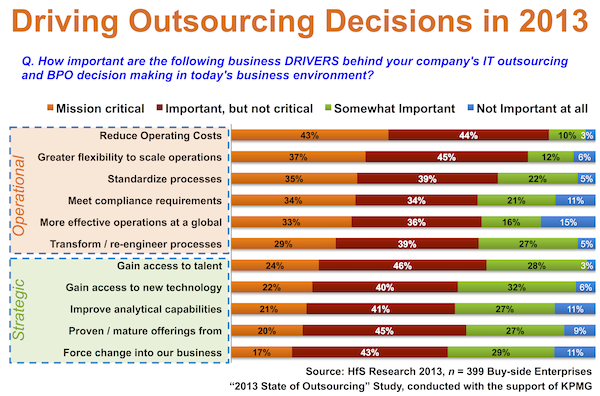 But before make a decision to outsource your IT tasks, we suggest you to pay your attention on those few points . 1. Costs reducing. According to research, the most important reason to outsource still “low price”. Unfortunately, such approach could lead to unfortunate results. Of course, working with Asian countries will help you to reduce the price, but you have to understand all the risks you will get and product quality. 2. Skills and Expertise. Finding skilled resources is one of the biggest challenges faced by companies today especially against the background with ‘cost reducing’ purpose. - to outsource in Asia/India only because of the low price. - to outsource in Eastern Europe (Ukraine, Belarus, Roumania etc.) This region offers highly skilled IT specialists at a acceptable cost with high quality, at the same time. 3. Communications and people management. Sometimes customer-outsourcer relationships break down simply due to lack of communication. It happens as a result of essential distinctions in mentality on different continents, like Asia and Europe. When you distribute IT functions outside your organization, you need a great deal of coordination and back-and-forth communications – best solution is to find professional IT supplier similar in mentality and culture. 4. Time zones. Eastern Europe covers a vast region, but time difference is not essential, making it easier to communicate within working hours. 5. Intellectual property protection. The Ukrainian system of intellectual property (“IP”) safeguards combines both national (laws and by-laws) and international standards (more than 15 international treaties on IP protection of which Ukraine is a party to). According to KPMG report “Your Business in Ukraine” 2012. Currently, about 60% of European companies enjoy the benefits of technology outsourcing their IT projects rather than having their own IT specialists in-house. Organisations can gain a number of benefits by outsourcing their IT function but only in case of choice reliable supplier. Some facts: Ukraine is among the TOP 10 countries with the most certified IT professionals; since 2007 Kiev is listed in Tholon’s TOP 100 Emerging Outsourcing Destination Cities List; since 2008 Ukraine was enrolled to A.T Kearney’s Global Services Location Index (GSLI) and increases its ranking year after year.